I had been looking for the headbands with the long hair. I want a turquoise one for a costume I'm making. I started at Dollar Tree because they had TONS of them the last time I was there. 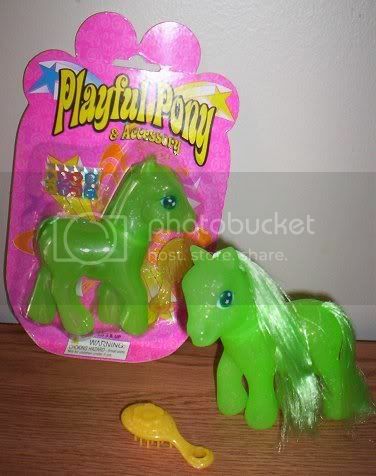 Fakie Divine Shine pony!!! Pity they only had two left and in lime green. I shall have to keep an eye out for new glittery love. Custom time! It was time to move on and keep searching for hair-headbands. Next stop was Dollar General. They have them! I know it! Baby pony scooters!!! If you think the quality of fakies are pretty low much of the time, trust me on this, these fakie ponies aren't even worth customizing. They are just misshapen, squishy, lumps of what can only be jokingly called 'pony' in the vaguest sense. But the scooters are great. Go figure. Friendship is Magic Necklaces available NOW! Clear sparkling Mane Six coming soon. The scooters are pretty neat. I wish someone would go a step further and make a remote control pony. One that can really walk and not just in a straight line, like most remote control animal toys. I think that would be neat. I love the sparklies. :biggrin: They are some of the best fakies, but yeah...those scooters are awesome too. Nice find! I picked up a couple of those scooter twins at DG two summers ago for the NJ Meet. I thought they were all long gone! I'm bringing some fakie oddities with me to the June MLP Fair for show n tell. 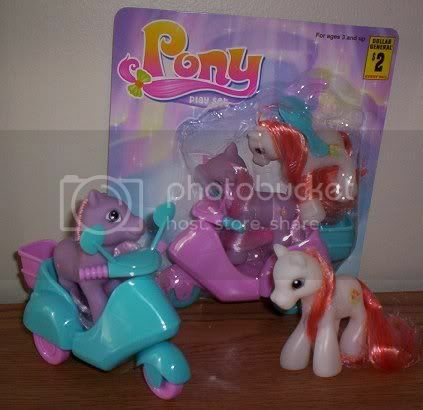 I just love those freaky phony ponies! I know the sparkle fakies were showing up in the southwest near Mexico and in South America. First time I had seen them anywhere up north. The scooters are really nice, thick plastic and seem to be well made. Makes me wonder if they really were suppose to be for real MLPs, but plans changed somewhere along the line. Like the tween ponies... Could someone at Hasbro answer 'What happened to the tween ponies?' We know they at least had a partial production run in China. They showed up on eBay. Oooo! I should add this to the questions for Hasbro. What are the tween ponies? Any pictures?